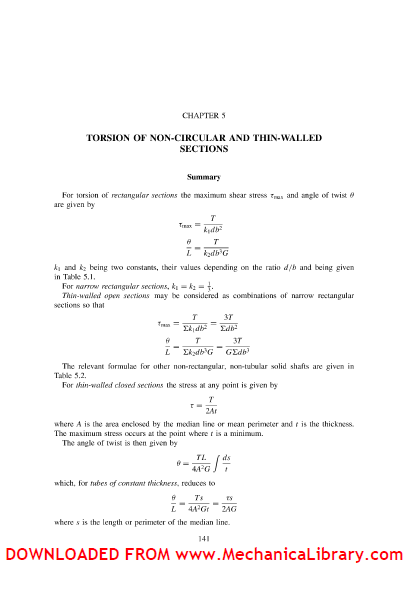 This text is a revised and extended third edition of the highly successful text initially published in 1977 intended to cover the material normally contained in degree and honours degree courses in mechanics of materials and in courses leading to exemption from the academic requirements of the Engineering Council. It should also serve as a valuable reference medium for industry and for post-graduate courses. Published in two volumes, the text should also prove valuable for students studying mechanical science, stress analysis, solid mechanics or similar modules on Higher Certificate, Higher Diploma or equivalent courses in the UK or overseas and for appropriate NVQ* programmes. 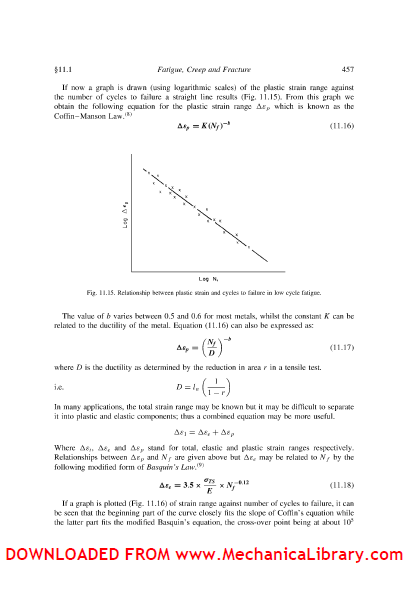 The study of mechanics of materials is the study of the behaviour of solid bodies under load. The way in which they react to applied forces, the deflections resulting and the stresses and strains set up within the bodies, are all considered in an attempt to provide sufficient knowledge to enable any component to be designed such that it will not fail within its service life. 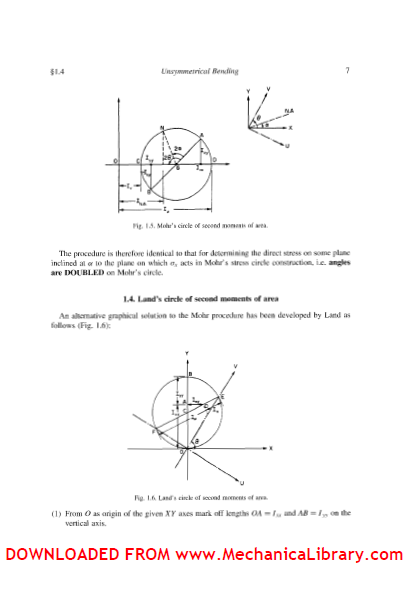 Typical components considered in detail in the first volume, Mecharzics of Materials 1, include beams, shafts, cylinders, struts, diaphragms and springs and, in most simple loading cases, theoretical expressions are derived to cover the mechanical behaviour of these components. Because of the reliance of such expressions or certain basic assumptions, the text also includes a chapter devoted to the important experimental stress and strain measurement techniques in use today with recommendations for further reading. 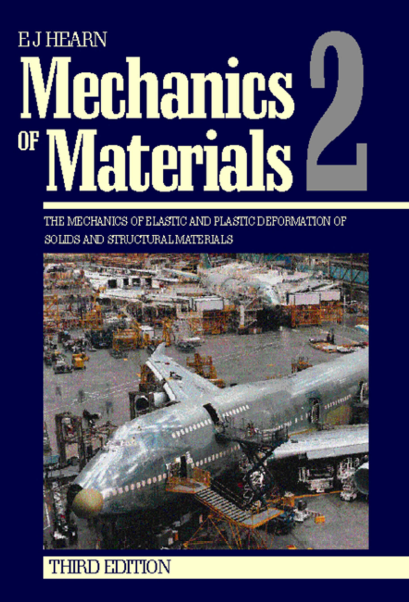 Building upon the fundamentals established in Meclzanics of Materials 1, this book extends the scope of material covered into more complex areas such as unsymmetrical bending, loading and deflection of struts, rings, discs, cylinders plates, diaphragms and thin walled sections. There is a new treatment of the Finite Element Method of analysis, and more advanced topics such as contact and residual stresses, stress concentrations, fatigue, creep and fracture are also covered. It has been shown that the simple bending theory applies when bending takes place about an axis which is perpendicular to a plane of symmetry. If such an axis is drawn through the centroid of a section, and another mutually perpendicular to it also through the centroid, then these axes are principal axes. Thus a plane of symmetry is automatically a principal axis. Second moments of area of a cross-section about its principal axes are found to be maximum and minimum values, while the product second moment of area, integral xy dA, is found to be zero. All plane sections, whether they have an axis of symmetry or not, have two perpendicular axes about which the product second moment of area is zero. Principal axes are thus defined as the axes about which the product second moment of area is zero. Simple bending can then be taken as bending which takes place about a principal axis, moments being applied in a plane parallel to one such axis. In general, however, moments are applied about a convenient axis in the cross-section; the plane containing the applied moment may not then be parallel to a principal axis. Such cases are termed "unsymmetrical" or "asymmetrical" bending. Structural members which carry compressive loads may be divided into two broad categories depending on their relative lengths and cross-sectional dimensions. Short, thick members are generally termed columns and these usually fail by crushing when the yield stress of the material in compression is exceeded. Long, slender columns or struts, however, fail by buckling some time before the yield stress in compression is reached. At values of load below the buckling load a strut will be in stable equilibrium where the displacement caused by any lateral disturbance will be totally recovered when the disturbance is removed. At the buckling load the strut is said to be in a state of neutral equilibrium, and theoretically it should then be possible to gently deflect the strut into a simple sine wave provided that the amplitude of the wave is kept small. This can be demonstrated quite simply using long thin strips of metal, e.g. a metal rule, and gentle application of compressive loads. Theoretically, it is possible for struts to achieve a condition of unstable equilibrium with loads exceeding the buckling load, any slight lateral disturbance then causing failure by buckling; this condition is never achieved in practice under static load conditions. Buckling occurs immediately at the point where the buckling load is reached owing to the reasons stated earlier. techniques in locating the source of the trouble can far outweigh the initial cost of the equipment involved. 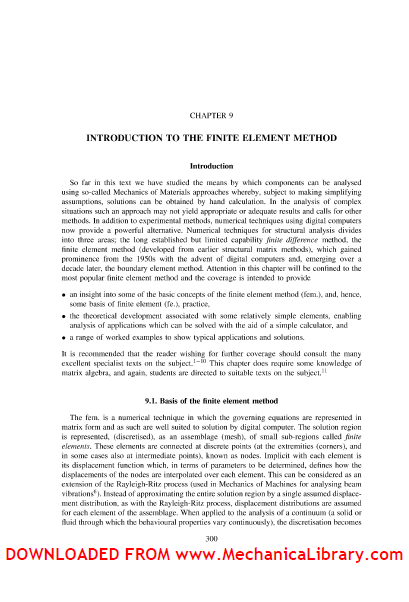 The aim of this chapter is to introduce the fundamental principles of these techniques, together with limited details of the principles of application, in order that the reader can appreciate (a) the role of the experimental techniques as against the theoretical procedures described in the other chapters, (b) the relative merits of each technique, and (c) the more specialised literature which is available on the techniques, to which reference will be made. The brittle-lacquer technique of experimental stress analysis relies on the failure by cracking of a layer of a brittle coating which has been applied to the surface under investigation. The coating is normally sprayed onto the surface and allowed to air- or heat-cure to attain its brittle properties. When the component is loaded, this coating will crack as its so-called threslzold strain or strain sensitivity is exceeded. A typical crack pattern obtained on an engineering component. Cracking occurs where the strain is greatest, so that an immediate indication is given of the presence of stress concentrations. The cracks also indicate the directions of maximum strain at these points since they are always aligned at right angles to the direction of the maximum principal tensile strain. The method is thus of great value in determining the optimum positions in which to place strain gauges in order to record accurately the measurements of strain in these directions. The brittle-coating technique was first used successfully in 1932 by Dietrich and Lehr in Germany despite the fact that references relating to observation of the phenomenon can be traced back to Clarke's investigations of tubular bridges in 1850. The most important advance in brittle-lacquer technology, however, came in the United States in 1937-41 when Ellis, De Forrest and Stern produced a series of lacquers known as "Stresscoat" which, in a modified form, remain widely used in the world today. There are many every-day examples of brittle coatings which can be readily observed by the reader to exhibit cracks indicating local yielding when the strain is sufficiently large, e.g. cellulose, vitreous or enamel finishes. Cellulose paints, in fact, are used by some engineering companies as a brittle lacquer on rubber models where the strains are quite large. As an interesting experiment, try spraying a comb with several thin coats of hair-spray lacquer, giving each layer an opportunity to dry before application of the next coat. Finally, allow the whole coating several hours to fully cure; cracks should then become visible when the comb is bent between your fingers. In engineering applications a little more care is necessary in the preparation of the component and application of the lacquer, but the technique remains a relatively simple and hence attractive one. The surface of the component should be relatively smooth and clean, standard solvents being used to remove all traces of grease and dirt. The lacquer can then be applied, the actual application procedure depending on the type of lacquer used. Most lacquers may be sprayed or painted onto the surface, spraying being generally more favoured since this produces a more uniform thickness of coating and allows a greater control of the thickness. Other lacquers, for example, are in wax or powder form and require pre-heating of the component surface in order that the lacquer will melt and run over the surface. Optimum coating thicknesses depend on the lacquer used but are generally of the order of 1 mm. In order to determine the strain sensitivity of the lacquer, and hence to achieve an approximate idea of the strains existing in the component, it is necessary to coat calibration bars at the same time and in exactly the same manner as the specimen itself. These bars are normally simple rectangular bars which fit into the calibration jig to form a simple cantilever with an offset cam at the end producing a known strain distribution along the cantilever length. When the lacquer on the bar is fully cured, the lever on the cam is moved forward to depress the end of the bar by a known amount, and the position at which the cracking of the lacquer begins gives the strain sensitivity when compared with the marked strain scale. This enables quantitative measurements of strain levels to be made on the components under test since if, for example, the calibration sensitivity is shown to be 800 micro-strain (strain x lop6), then the strain at the point on the component at which cracks first appear is also 800 microstrain. This type of quantitative measurement is generally accurate to no better than 10-20%, and brittle-lacquer techniques are normally used to locate the positions of stress maxima, the actual values then being determined by subsequent strain-gauge testing. how can i got the solution of the text book?